Life’s not always a handful of roses floating in a bucket of Dom Perignon. Sometimes, what afflicts us is internal – elements of our own personality, or past, or even, tragically, our own blood. Other times, it’s the outside world that plays the role of nemesis, either the vast, implacable nature, or the multitudes of humans that surround us. Sometimes, you just end up chewing on something sour when you were expecting sweet. Then you make a funny face. 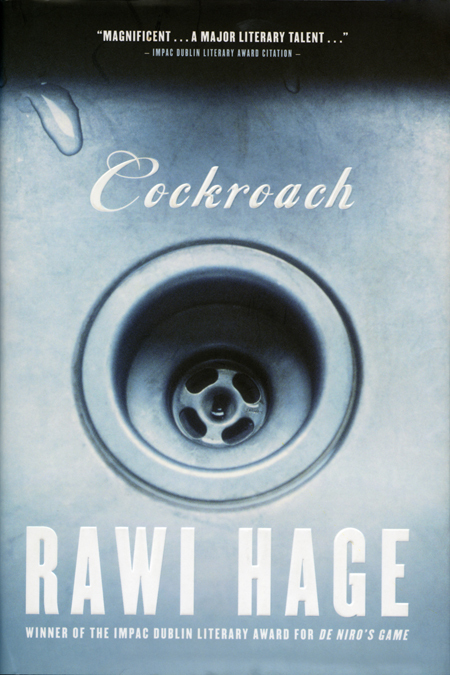 The face the narrator of Montreal-based writer Rawi Hage’s second novel (after the award-winning DeNiro’s Game) chooses to wear is that of a cockroach. The protagonist of the aptly-titled Cockroach (2008) is an immigrant with a veiled, somber past who, arriving in Canada from a war-torn country (unnamed but not without reminding us of Hage’s native Beirut), finds himself increasingly estranged from reality and the world around him. The novel, gritty and dark, moves between accounts of the narrator’s attempts at fitting in as a waiter in a middle-eastern restaurant; his past-unearthing session with a French-Quebecois therapist; and his nocturnal fantasies of transforming into a cockroach and moving through other people’s apartments and plumbing. Yes, you read that last sentence right. The book, with Kafka (obviously) and existentialist writers such as Camus as spiritual godfathers, explores not only the very real and tangible difficulties immigrants experience when arriving here (whether it be finding a job or surviving our balmy winters), and the more internal, psychological scars that is the inheritance of those who survive growing up in a war zone. In the narrator’s case, it is the trauma of his past life (and his sister’s terrible tragedy) that force him into the role of the crawling cockroach, the flight of dark fancy that is his only method of coping with the wounds; he crawls in the walls and pipes and through the drains, moving unseen and unwanted, shattered and shell-shocked. 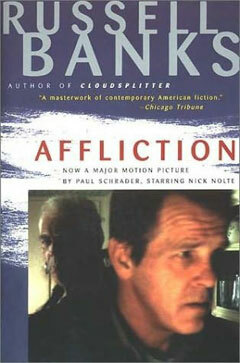 On the other hand, what ails Wade Whitehouse and his brother Rolfe in Russell Banks exceedingly stark and powerful novel Affliction (1990) is the virulent poison of violence that crawls through blood, down the generations of men of a certain type. The story is narrated by Rolfe, who alone escaped the small Massachusetts town of his family, and in some ways the violence of his father. His brother Wade, a tragic mountain of a man, struggles daily with the various demons he inherited from their father. When a rich tourist is killed in a hunting accident, Wade, the local part-time Sheriff, becomes obsessed with the case, seeing in its resolution his only possible chance of redemption. Banks, known for his close observation of domestic schism and the human condition, paints a moving but forcefully tragic drama on a cold canvas of bone-white winter. Through Rolfe’s narration, we become aware of not only Wade’s tempestuous abilities to both do good and evil, but also of the source of this malignancy, their father. Not as immune to the family curse as he believes, Rolfe provides nonetheless a striking picture of his brother, one pregnant with love and hate, fear and pity. Wade, for his part, shambles through, increasingly out-of-control; an extended sequence between him and his young estranged daughter is particularly affecting, illuminating the impact of familial violence even on those who appear best shielded from it. The film version, written and directed by Paul Schrader, and starring Nick Nolte as Wade, is also worth checking out.